This Citroen DS3 is available in Silver, Black, White, Red, Blue other colours and lease options, subject to availability and includes a warranty. The DS3 Hatchback makes possible for a vehicle to combine impressive functional qualities of load volume, payload, robust strength and economy with attractive styling and a user-friendly design. An extensive range of graphics for the roof, plus the option of colour-coded alloys and door mirrors give you more exterior choices. Very smartly styled, reasonably practical, well equipped and affordable, it should appeal strongly to young drivers and others alike. The DS3 has excellent mix of qualities, very easy to drive. Offers range from petrol to diesel engines and various body colour styles. Contact us today for latest lease options for Citroen cars. We offer top quality Citroen DS3 from brand new, nearly new, slightly used or ex demo, whether you have good or poor credit rating, pay a low or no deposit. These Citroen DS3 can be leased or financed and come with a warranty, HPI checked and when contract hire leasing, include UK nationwide delivery and AA or RAC Roadside Assistance cover for peace of mind. 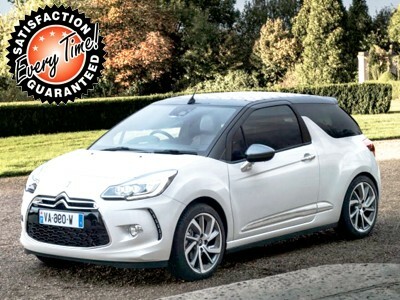 Time4Leasing can offer you the latest Citroen DS3 lease deals at lower prices because these vehicles are exclusive and offered at lower rates to customers that have good, poor or even bad credit history score ratings. The Citroen DS3 has a choice of 11 body colours and four roof shades, but that's just the start of it. An extensive range of graphics for the roof, plus the option of colour-coded alloys and door mirrors give you more exterior choices. Options for the cabin include colour-coded panels, along with various carpet designs. Even entry-level DSign cars get stability and cruise controls, along with electric front windows. DStyle adds air-conditioning, front LED running lights and tinted rear windows. DSport cars bring climate control, Bluetooth, 17-inch alloys, a rear spoiler, chrome side rubbing strips and aluminium pedals. Citroen is also offering a pre-paid servicing package for the DS3, which gives an extended warranty and covers the cost of servicing for three years. The DS3 offers an excellent mix of qualities for a young driver or first time car buyer. Very smartly styled, reasonably practical, well equipped and affordable, it should appeal strongly to younger drivers. It's not a difficult car to drive for the novice, and the economical diesel options will help with running costs. Six airbags and a reinforced safety cell are standard and the DS3 can boast a five-star safety rating. ABS with brake-force distribution is standard as is ESP. Isofix points are also included. There are 72 Citroen DS3 Lease Deals on Offer.